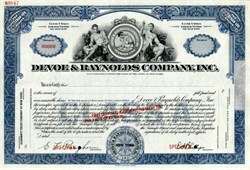 Beautifully engraved RARE specimen stock certificate from the Devoe & Raynolds Company, Inc. printed in the 1950's. This historic document was printed by the American Banknote Company and has an ornate border around it with a vignette of an indian flanked by two allegorical men. This item has the printed signatures of the Company�s President and Secretary. Devoe is America's oldest maker of paint and remained Grow's chief subsidiary into the mid-1990s. Devoe was started in 1754 by William Post, who opened a paint shop in New York City. The company prospered during the 1800s and 1900s by becoming a leading innovator and supplier in the industrial and commercial coatings industry. Devoe expanded through acquisition and merger. In 1928 and 1938, for instance, Devoe absorbed the varnish divisions of Peaslee-Gaulbert Co. and lacquer operations of Jones-Dabney Co.
Devoe is recognized for its advanced research and development efforts. Among the company's most notable inventions, in fact, is epoxy resin. Introduced in 1945, that discovery is credited as one of the most significant breakthroughs in coating technology during the twentieth century. "Epoxy resin is the backbone of all high-performance resins, giving them durability, hardness and adhesion," explained Gary Miller, Devoe & Raynolds president, in the Courier Journal. "Before epoxy resin, the coatings on chemical plants may have lasted a matter of months. After epoxy resin, the job lasted a matter of years." Devoe was bought by Celanese in 1964 before GrowGroup Inc. acquired it in 1976. In the early 1990s Devoe & Raynolds and its sister company, Devoe Coatings, were supplying about 60 percent of Grow's total revenues.